In Australia, Victoria the ill-fated myki smart card system is set to go live on buses and trams on Sunday, according to ABC News. The $1.3 billion system has already been active on Melbourne’s metro trains for months, but technical issues have kept it from being implemented across all public transportation in Victoria. 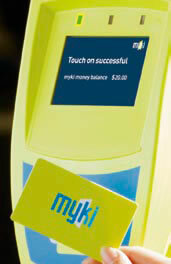 Public Transport Minister Martin Pakula warns commuters to expected some technical difficulties when using myki on buses and trams this weekend.